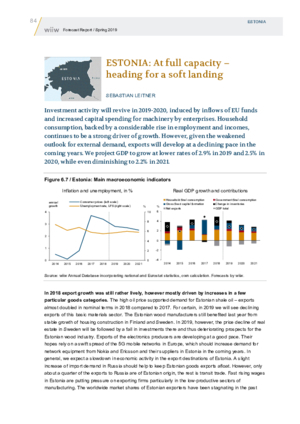 Investment activity will revive in 2019-2020, induced by inflows of EU funds and increased capital spending for machinery by enterprises. Household consumption, backed by a considerable rise in employment and incomes, continues to be a strong driver of growth. However, given the weakened outlook for external demand, exports will develop at a declining pace in the coming years. We project GDP to grow at lower rates of 2.9% in 2019 and 2.5% in 2020, while even diminishing to 2.2% in 2021.